Taken by intermediaries after they convince village families to pay for an education at pseudo hostels, the children are in fact brought to madrassas (Islamic schools) where imams force them to abjure Christianity. The latest case has a happy ending however when 11 children were able to escape from captivity. Dhaka (AsiaNews) - In Bangladesh, Christian children from Tripuri tribes have been taken away from their villages and forcibly converted to Islam. Local Catholic sources, who asked their names be withheld, told AsiaNews that almost 300 children have been taken to madrassas (Islamic schools). The story is the same. So-called intermediaries, who are also ethnic Tripuri, visit poverty-stricken communities where they convince families to send their children to a mission hostel, charging between 6,000 and 15,000 taka (US$ 500 to 1,200) for school and board. After pocketing the money, the intermediaries sell the children to Islamic schools elsewhere in the country. 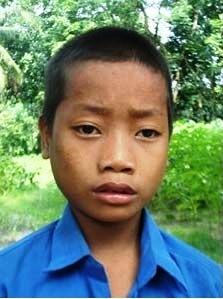 The latest case involved 11 children, ten boys and a girl, from Thanchi, Ruma and Lama in the Chittagong Hill Tracts. Their story has a happy ending though. After six months of threats and violence, the children were able to escape thanks Hotline Human Rights Trust, a Dhaka-based civil rights organisation that defends minorities run by a Catholic woman, Rosaline Costa. Tripuri are one of the many tribal groups found in Bangladesh. Most are Christian, both Catholic and Protestants, especially in the Chittagong Hill Tracts, in south-eastern Bangladesh. Radical Muslims are engaged in a campaign against Christian missionaries whom they accuse of proselytising and forcibly converting others in order to create a Christian majority in the area so that it can be annexed to India. In the latest case, the first eight boys were taken in January and February and brought to the Darul Huda Islami School in Mia Para village (Gazipur). The girl was placed in a madrassa (whose name she could not tell) in Muhammadpur, Dhaka. The other two boys were brought to another Darul Huda Islami in Maddha Badda (Gulshan, Dhaka). Their days included Arabic lessons (8-12 AM), Qur'an reading (Nurani Shikkha, 2-5 PM) and five daily prayers. In their respective madrassas, the children found other tribal Christians, many even younger themselves. They also saw acts of physical violence when children missed prayers or refused to take part in a lesson. In fact, after she was rescued, the girl showed scars to the hand, where she was struck with a cane. In June, the desire to escape was kindled when imams announced that the boys would be circumcised, and that if they were ready to give their lives for Islam, they would be compensated with beheshta or heaven since no other religion could lead them there. Scared, the first eight boys asked a Hindu family that lived near the school for help. They told their stories, asking them to contact their parents. When the latter found out what had happened to their children, they contacted the Hotline Trust to save them. Four boys escaped on 4 July; the other four on 13 July. When the other two (somewhat older) boys found out about their escape, they too fled and contacted the Hotline Trust on their own. The girl's rescue was a bit more complicated. She was saved only after another girl escaped and told people in her village what had happened. The girl's parents then contacted the madrassa huju or teacher asking him to let her go. The latter said the father had to come and get her. At the school, the teacher tried to provoke the father, denigrating the Bible and accusing Christians of adultery and immorality. The father put up with the insults and eventually took his daughter home on 13 July.